View all products by The Seaweed Bath Co. 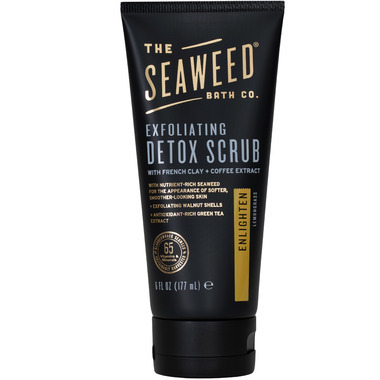 The Seaweed Bath Co.'s Exfoliating Detox Body Scrub combines nutrient-rich bladderwrack seaweed with French clay and coffee extract to purify and exfoliate for softer, smoother-looking skin. A body scrub gentle enough to use every day. Best for those who want a luxurious scrub to improve the look and feel of skin. Organic, sustainably-harvested bladderwrack seaweed with 65+ vitamins and minerals naturally detoxifies and promotes skin elasticity. Antioxidant-rich green coffee bean extract helps to detoxify and protect skin against damaging free radicals. Mineral-rich French clay helps to purify skin and wash away toxins and impurities. Detoxifying green tea extract, rich in potent antioxidants, protects and moisturizes. Walnut Shells gently exfoliate skin to help remove dead skin and rough patches. Alternate with our Purifying Detox Body Wash. Follow with our Firming Detox Cream. Gluten Free and Paraben Free. Directions: Massage onto wet skin. Rinse clean. Use 2-3 times per week or as needed. Alternate with our Purifying Detox Body Wash. Follow with our Firming Detox Cream. Ingredients: Aqua (Water) with Fucus Vesiculosus (Bladderwrack Seaweed) Extract, Sodium C14-16 Olefin Sulfonate, Cocamidopropyl Betaine, Juglans Regia (Walnut) Shell Powder, Montmorillonite (French Green Clay), Coffee Extract, Camellia Sinensis (Green Tea) Leaf Extract, Coffea Arabica (Green Coffee Bean) Extract, Epilobium Angustifolium (Willow Herb) Extract, Cymbopogon Schoenanthus (Lemongrass) Oil, Carbomer, Vegetable Glycerin, Dipotassium Glycyrrhizate, Tocopheryl Acetate, Phenethyl Alcohol, Citrus Aurantium Dulcis (Sweet Orange) Oil, Ethylhexylglycerin, Spiraea Ulmaria (Meadowsweet) Extract, Citrus Paradisi (Grapefruit) Oil, Mentha Piperita (Peppermint) Oil, Coriandrum Sativum (Coriander) Extract, Citrus Limon (Lemon) Oil.